Obsessive cleanliness is one of the most common OCD symptoms. OCD sufferers often spend a significant amount of time cleaning, as this is a prominent OCD compulsion and obsession. 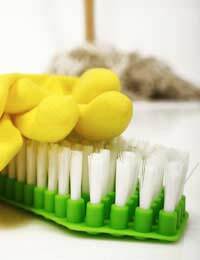 As well as repeatedly cleaning and disinfecting surfaces, obsessive cleanliness also involves cleaning your hands and clothes on a regular basis. This article looks at obsessive cleanliness as one of the symptoms of OCD. Why Do OCD Sufferers Develop a Cleaning Obsession? In most cases, obsessive cleanliness stems from strong fears of being contaminated by germs or dirt. This obsession is common in OCD sufferers, who frequently engage in compulsive cleaning rituals to reduce anxiety. As well as frequent cleaning, many sufferers are also reluctant to shake hands with other people or have any physical contact with them in case they come into contact with germs or dirt. Sufferers may repeatedly wash their hands until they are red raw (and even bleeding), just to make sure that their hands are fully rid of germs or dirt. Can Obsessive Cleanliness Be Treated? Many OCD obsessions can be treated with anti-obsessional medication, as well as anti-depressants if depression is also present. Other forms of treatment include Behavioural Therapy (BT) and Cognitive Behavioural Therapy (CBT). Some experts suggest that BT is a more effective form of treatment than OCD medication, but many OCD sufferers are afraid of facing up to their fears and immersing themselves in the very situations that prompt their OCD or make it worse. This is a key component of BT and CBT treatments, meaning that they are likely to have a good success rate on those who are ready to do this. The combination of engaging in situations that trigger OCD-related anxiety and distress, and gently increasing the time between carrying out compulsive rituals is intended to phase out obsessions and compulsions. Both BT and CBT do have a good success rate among OCD sufferers as there is some evidence to suggest that it can alter the chemical make-up in the brain (which is slightly different between OCD sufferers and those who do not suffer from OCD), but it can take some time to break the mental hold. Obsessive cleaning is one of the most common obsession and compulsion symptoms of OCD. Sufferers frequently develop an obsession that revolves around fears of being contaminated by germs or dirt, and this presents itself in the compulsive ritual of obsessive cleanliness. Compulsive cleaning rituals can have a considerable effect on the daily lives of OCD sufferers. Treatment can take various forms, including anti-obsessional medication, Behavioural Therapy (BT) and Cognitive Behavioural Therapy (CBT). What If Your Compulsive Thoughts Are Making You Suicidal? Quiz: Is Your Child Suffering from OCD? Quiz: Do You Have Pure 'O' OCD?